On Wednesday, 4th December, 2013, Food Sovereignty Ghana FSG met with the Parliamentary Committee on Constitutional, Legal and Parliamentary Affairs. The meeting was in response to an invitation, as a result of an earlier petition to parliament on the plant breeders bill 2013/ served on the Committee by FSG. The FSG delegation of eleven comprised of Mr. Duke Tagoe, Deputy Chairperson of the FSG, Mr. Kweku Dadzie, Secretary, Ms. Samia Nkrumah, Chairperson of the CPP, Mr. John Yaw Opoku, Mr. Ras Aswad Nkrabeah, Blakk Rasta, among others. If the FSG did not know what we were talking about, it would have been a mission impossible. The meeting was fully attended. There were all the key persons connected with biotechnology and pro-GMO experts in the country present to defend the Plant Breeders Right or PBR. Also present were the Director of the CSIR, together with all the Heads of Departments of the CSIR. each department with its lawyer. The Attorney-General and Minister of Justice was also present, with her secretary. It was obvious that they had come fully prepared. All of them came with copies of all the statements ever issued by FSG. It was clear from the beginning that the main intention was to punch holes into our petition. The impression of the atmosphere was one of a determination to challenge every item in our petition, not only to make sure that they would collapse our argument against the PBR, but also to discredit the FSG as an organisation. There was an attempt to ridicule our connecting the Plant Breeders’ Bill to the issue of GMOs. We were told categorically to get it straight that the Bill had nothing to do with GMOs! This was buttressed by the Attorney-General and Minister for Justice, who vehemently condemned the link as being non-existent. What saved the day for us was an intervention from Professor Walter Sando Alhassan who stepped in to clear the misconceptions, and making it clear that the Bill had everything to do with GMOs. We shall soon be coming out with a separate article on this issue. The objections by FSG to this particular clause were unassailable. The FSG petition recommends “ix/ Delete Section 23 on Measures regulating commerce.” FSG position is that it is important for the Bill to be coherent with other legislation and national interests such as the protection of environment, health, prevention of misappropriation of genetic resources etc. The inclusion of Clause 23 hinders the ability to achieve such coherence as it views the grant of PBR as being independent from other regulations. In certain cases it may be important to refuse to grant PBR over a variety, particularly where national interests are at stake. Such situations include not granting PBR on varieties that are injurious to public health, environment etc or where the application does not disclose the origin of the genetic material. An area where we strongly disagree is why the government opted for UPOV 91 in the first place. The Bill is presented, first and foremost as being in fulfilment of the requirements of UPOV 91, which incidentally is also in conformity with the WTO rules. We can fulfil our WTO obligations without UPOV. We do not need UPOV. It is a very restrictive and dangerous trap into a permanent enslavement and loss of our sovereignty as a people. This is what is staring at us in the face. Our destiny as a people is involved in which decision our Members of Parliament make. Ghana is a member of the World Trade Organization and the rights and obligations concerning intellectual property are governed by the WTO Agreement on Trade Related Aspects of Intellectual Property Rights (TRIPS Agreement). According to Article 27.3(b) of the TRIPS Agreement, Ghana has to provide protection of plant varieties by an “effective sui generis” system. Sui generis means “unique” system of protection. This provision allows Ghana maximum flexibility in the design of plant variety protection (PVP). This means that Ghana has the option of using this flexibility to innovatively design a PVP system that reflects the conditions prevailing in Ghana. This is what many advanced developing countries such as Thailand, Malaysia, India have done. The African Union Ministers have also recommended a unique Model Law for Plant Variety Protection. The bill ignores all of these developments. The Bill presented is neither innovative nor does it reflect the conditions prevailing in Ghana. It is simply based on the 1991 Act of the Convention for the Protection for New Varieties of Plant (UPOV 1991), a restrictive and inflexible legal regime. UPOV 1991 came about with the development in industrialized nations of large scale commercial farming and professional breeding focused on producing uniform varieties. UPOV 1991 is extremely rigid, with very limited flexibility given to governments to accommodate their socio-economic conditions. UPOV 1991 is also in conflict with the International Treaty on Plant Genetic Resources (ITPGR) as the terms of UPOV 1991 does not allow full realisation of farmers rights. Thus to date of 71 countries that have signed up to the UPOV Convention, only about 22 countries are from developing countries and most of these are members of UPOV 1978, while most developed countries are members of UPOV 1991. Compare this with the 166 number of countries which have signed up to the Cartagena Protocol on Biosafety and to the Convention on Biological Diversity, which is even much more recent. It is not for nothing that at present, in Africa only Morocco and Tunisia are signatories to UPOV 1991, while Kenya & South Africa are signatories to UPOV 1978. The previous Convention of UPOV 1978 is no longer open for ratification and new members are only able to join UPOV 1991. The rigidity and inflexibility of UPOV 1991 and the failure to appreciate the varying needs and conditions of developing countries has deterred many developing countries from joining UPOV 1991. It is thus not in the interests of Ghana to adopt a Bill based on UPOV 1991 or to join UPOV 1991. Ghana should investigate and explore other models on PVP (e.g. The Indian PVP law, the AU Model law) and design its own PVP regime based on its own needs and priorities in particular the interests of its farmers, its food security needs. In the current Bill the farmers rights are subject to the discretion of the Minister of Agriculture, whilst the rights of foreign corporate plant breeders are put above the state! The Committee insisted that they had already put laws in place to protect the Ghanaian farmer, although FSG has not seen evidence of this. On the issue of Clause 23, the Committee admitted it was worthy of consideration. Also accepted for further consideration was the issue of linkage of GMOs with the Plant Breeders’ Bill. 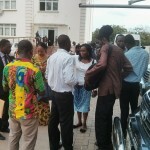 After a passionate appeal from Ms. Samia Nkrumah, calling on the Committee to carefully examine the petition, the Chairperson of the Committee promised the petition would be given due consideration, and thanked Food Sovereignty Ghana for making our concerns available.The meeting lasted for almost two hours. We shall be coming out with a full report soon.